Summer’s here, but we have our own little ice storms to keep us on our toes. Today the girls enjoyed a homemade ice-block about half an hour before a hailstorm pummeled our house. 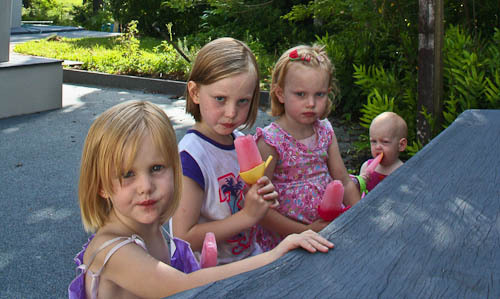 The girls love having an ice block on a hot afternoon. Dell’s so cute. She doesn’t want to miss out on what her sisters are enjoying and has started to make her desires and intentions very clear with signs, grunts and shrieks. I’m looking forward to when she starts talking!